This sandtimer measures approximately 6" (150mm) in height and just over 3.5" (90 mm) in diameter. Housed in a circular wooden stand with three turned pillars, the sand flows quite freely and it takes approximately 15 minutes to empty, give or take a few seconds. Probably a mid 20th century example, it's not only very functional, but also a great display piece with a stylish concentric circle design on both bases. In excellent cosmetic condition, it weighs just under 300 grams. 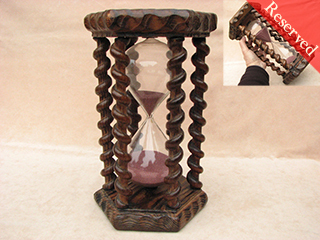 This unique and eye-catching hand crafted sand timer stands at 11½"(293mm) tall by 7"(178mm) at its widest point and is housed in a hexagonal wooden stand surrounded by six barley twist pillars. A substantial item weighing just under 1.2kgs, the sand flows through a single piece glass vial, taking approximately 30 minutes to empty give or take a few seconds. Made from what I believe is olive wood, there is a small split on the top and some minor gaps where a couple of the pillars meet the base, but is in otherwise very good condition. Probably mid 20th century, a stylish decorative piece which displays very well. Probably made during the first half of the 20th century, this unusual design sandtimer measures just over 10¾ inches in height (270mm) and 5 inches wide (125mm). The single piece glass vial is housed in a mahogany stand with four square pillars and the sand flows quite freely, taking approximately 60 minutes to empty give or take a few seconds. It also includes a brass hanging ring, suggesting it might have been hung up for display, and the feet are covered with green felt. In excellent cosmetic condition, a substantial piece weighing just over 900 grams. A quite unusual item, this is a Daylight Factor Meter made by a company called Evans Electroselenium Ltd in the 1960's. Architects & engineeers use daylight factors in building design to assess the internal natural lighting levels to determine whether it is sufficient for occupants to carry out normal activities. A well made robust instrument, it has a base diameter of 80mm and stands just 75mm high, with a weight of just over 600 grams. It fits in a purpose made leather box with a roof shaped lid and lined inside with a red velvet like material. In full working order, it also has a manufacturers paper inspection tag for 1964, albeit with the serial number 33/1143, and not 33/1132 as is stamped on the baseplate. 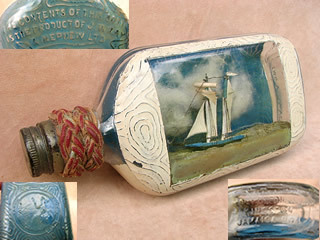 This ship in a bottle is quite unique, having been made in an early J. Wray & Nephew rum bottle. Wray & Nephew are the famous Jamaican rum distillers first established in 1860 whose products are still very much in demand today, with some of their earlier vintages fetching many thousands of pounds at auction. The decorative appeal of the earlier glass bottles have made them very collectable and this particular example which dates to the 1920's or 30's has the added interest of a ship cleverly constructed within. The exterior of the bottle carries an embossed image of Britannia in a circle, and reads ‘THE CONTENTS OF THIS BOTTLE IS THE PRODUCT OF J. WRAY & NEPHEW LTD’ and the base reads ‘J. WRAY & NEPHEW LTD, KINGSTON, JAMAICA, B.W.I.’, there is also a turks head knot around the bottle stem. Measuring 200mm long, 95mm wide & weighing just over 0.5kg, this is not only a rare item but a great display piece which will appeal to both bottle and nautical model collectors. This is a fine example of a celestial Star Globe made in 1975 by Kelvin Hughes for the Admiralty. Used for night time navigation by the Royal Navy, its not only functional, but a beautifully crafted display piece which would grace any nautical collection. The globe itself was made by British globe makers George Philip & Sons and assembled in a mahogany case with its brass fittings by Kelvin Hughes. Its in good condition overall, and the globe in particular is free from any scuffs or tears. There are printed instructions on the inside of the lid with two brass cursors on the back rail, and the case is carried by an inset brass handle. Measuring 11" high x 10.5"x 10.5" it weighs just over 5kgs, so unfortunately overseas shipping is very expensive even though I do subsidise it. This is an Abney level & clinometer, made by Francis Barker & Son Ltd of Edenbridge. Used by surveyors for measuring angles of incline, it has a vernier style scale and incorporates a spirit bubble level fixed to the moving scale pointer. There is also a moveable magnifying lens arm for reading the fine scale, and it comes with an instruction leaflet. Viewing through the telescopic eyepiece shows a fine wire alongside the image of the moving spirit bubble which is central when the object being measured is correctly sighted. In working order and good condition, it measures 7” long with the telescopic eyepiece extended, 2 1/4" wide and fits in its original fabric lined leather case which is also in good sound condition, no broken stitching.